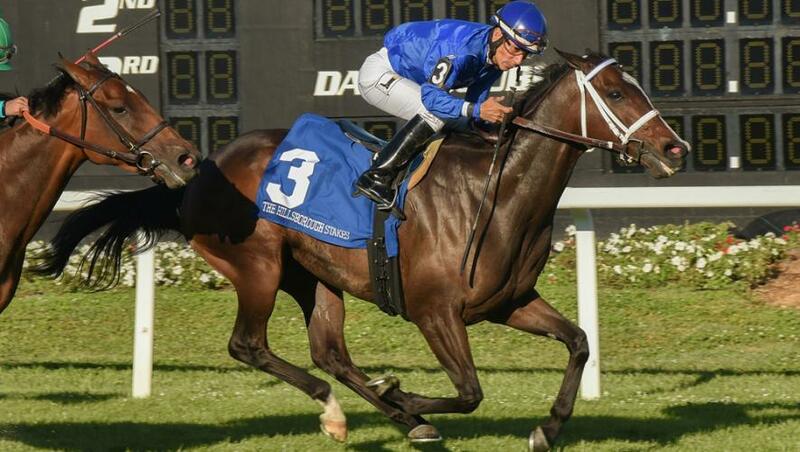 Five-year-old mare Dickinson came through strongly to continue her progress and capture the 10-runner G2 Hillsborough Stakes over nine furlongs on turf at Tampa Bay Downs, USA, on Saturday, March 11. The Kiaran McLaughlin-trained Godolphin runner has thrived since switching from dirt, winning four of her five races on turf. Paco Lopez, on board for the second successive time, has now won two Graded races on Dickinson who was settled in fifth on the inside after breaking fast from the stalls and being more prominent early on. The daughter of Medaglia d’Oro made smooth progress turning in and moved up to second before being switched out to challenge the leader Isabella Sings in the straight. Dickinson led inside the final furlong and comfortably held the challenge of Elysea’s World by a half-length in 1m 46.75s, just 0.49 seconds outside the course record set in last year’s Hillsborough by Tepin. Kiaran McLaughlin said: “Dickinson ran really well again and is a very nice mare. “This was the second time over a mile and a furlong and Paco Lopez has ridden her to perfection. “She won the G3 Suwanee River at Gulfstream Park on her previous start and now has taken this G2 race. Another Keeneland first for Dickinson?